You can subscribe to all of our shows in one handy feed! Coming Soon! - Welcome to the first on our new podcasts for 2018-2019, A Day In The Life At FCC is recorded by the two members of the KS3 Felpham FM team and will cover everything from discussions about school life, as well as features such as book of the week. A fortnightly discussion of all things sport related - covering the college’s sporting achievements and anything else from across the globe. Felpham FM has joined forces with J M Bulpett to help distribute the audiobook version of Hood. Coming Soon! - Welcome to the second on our new podcasts for 2018-2019, The Last Lap is recorded by the a member of the KS3 Felpham FM team and will cover everything from the world of Motorsports! 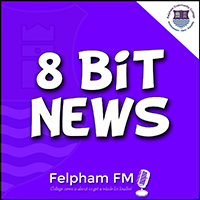 Welcome to the third on our new podcasts for 2018-2019, Pride Of Felpham is recorded by the a member of the KS5 Felpham FM team and is our first podcast focusing on LGBTQ topics and content. We couldn’t be happier to welcome this podcast to the Felpham FM family and we guarantee you will love listening to the content covered. A fortnightly discussion of all things television! A fortnightly podcast which focus on the world of RPG board games. A fortnightly podcast from the KS3 Journalism students, covering news, youtube, books and just about anything else they feel like talking about! A fortnightly podcast from the KS3 journalism students giving a fun, lighthearted overview of the local, national and world news, covering the normal to the outright bizzare.